As I’ve mentioned before, my son LOVES music! He probably didn’t have a choice since he has been engulfed in it since he was in utero. 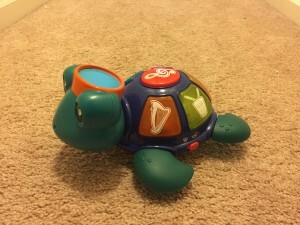 Anyway, I thought I’d share a few of our favorite musical toys, toys that he enjoys playing with, and toys that make me as a musician, music teacher, and music therapist, HAPPY! 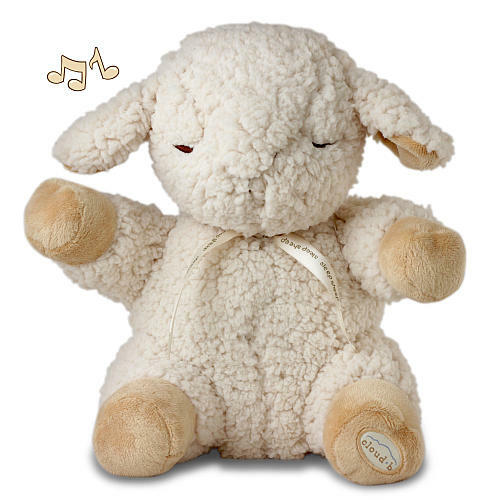 I’ve mentioned the Sleep Sheep in another post and gift this to everyone I know having a baby. While I don’t think of this as a musical toy, I thought I’d remind you of it now. We have a large one for his crib and a smaller, portable one for on the go. The sheep makes beautiful nature sounds which are great for lulling baby to sleep. 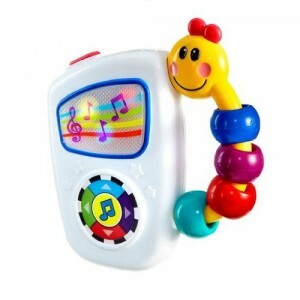 Remember it has a timer on it (musical toys, especially those on the crib, should only be played for limited amounts of time) and you need to keep the volume low so as not to damage baby’s hearing. This was gifted to me at my baby shower from a good friend and music therapist. Its definitely a favorite of both my son and I. He loves the colorful lights that light up and the big, colorful buttons to push. I love the classical music that is played and the way it introduces different instruments (hear each instrument play its part individually). Also it has a volume control so I can make sure it doesn’t play too loud. And its a turtle, so what’s not to love? We picked up this little piano while shopping with my mother-in-law (who spoils my son WAY TOO MUCH). Again its colorful lights and buttons attract my son’s attention, but also his love of animals and instruments is rewarded. The five tone piano has fabric keys to play Do-Re-Me-Fa-Sol. The piano can be set to play the sound of instruments (piano, trumpet, or violin), or animal sounds (cat, dog, duck) or numbers (1-5). There is also a language setting: English, French, or Spanish which I love since I’m trying to introduce languages from the start. Most importantly it has a volume control to make sure its not too loud. 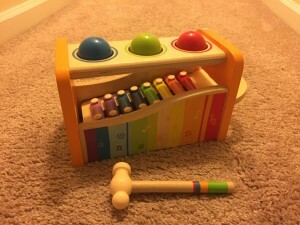 This wooden toy which is painted with non-toxic paints, offers hammering, 3 colorful balls, and a xylophone. When you hammer the balls they fall and land on the xylophone which is at a slant. As the ball runs along the xylophone it plays. 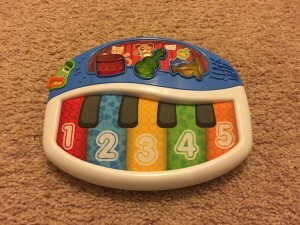 The only downside to this toy is that the xylophone is not completely in tune to the proper scale. However its still a fun musical instrument with lots of ways to play. My son mostly likes to pull the xylophone out and play it with the mallet, but we’re working on matching the colors of the balls to their proper holes. 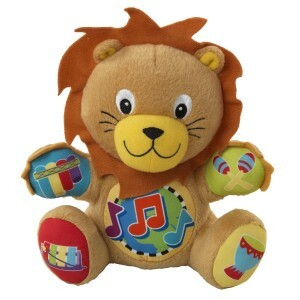 This musical lion plays a fun little song in five ways. Hear the whole song with all the instruments or select just one of the instruments to hear its individual part of the song: maraca, drum, xylophone, pan pipes. (Volume control on the power box.) Great for under 1 year of age. This little music box is great for on the go. My son loves it in the car! Little colorful lights dance to the music which is again lovely classical pieces. Colorful beads are great for chewing or manipulating! Again, there is a volume control. While I’m not typically a fan of plastic toys, this great yard sale find is actually pretty cool (again sent by my mother-in-law). 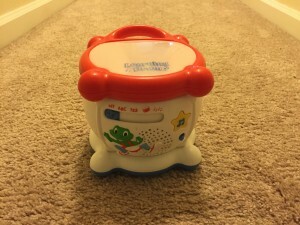 It encourages the child to “hit the drum, its fun!” and offers the ABCs, numbers, the tones of the song, or free drumming. There are little lights on the top that make the letters or numbers or random images for the free drumming or tones. Again it has a volume control which is a must! What quality musical toys have you found that your little ones like? Please share! 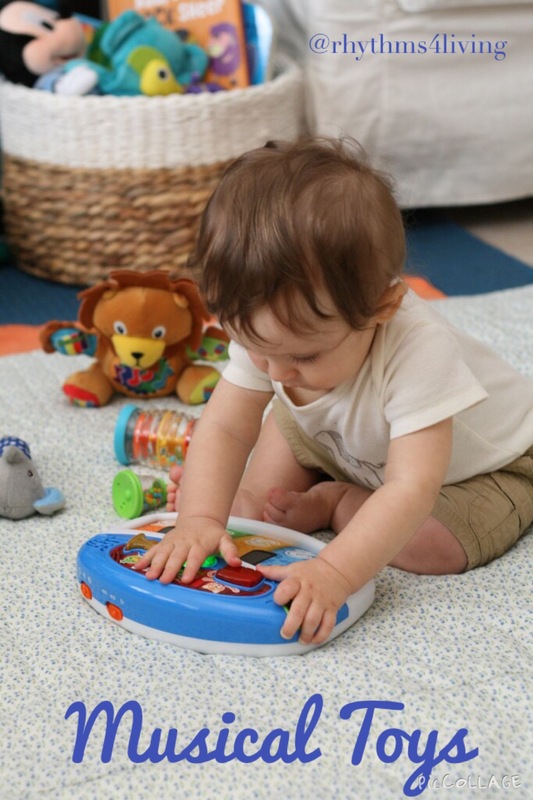 To see more recommended musical toys and other instruments, books and materials, visit our Resources Page.